The tiny island of Philae, a mere 450 metres long and less than 150 metres wide, captured the imagination of countless travellers to Egypt from early times. It was famedrfor its beauty and was known as the ‘Pearl of Egypt’. Plants and palm trees grew from the fertile deposits that had collected in the crevices of the granite bedrock. Gracious Graeco-Roman temples and colonnades, kiosks and sanctuaries rose proudly against the skyline. There was a sense of mystery. Not furtive, inviolate secrets, so much as veiled mystification. 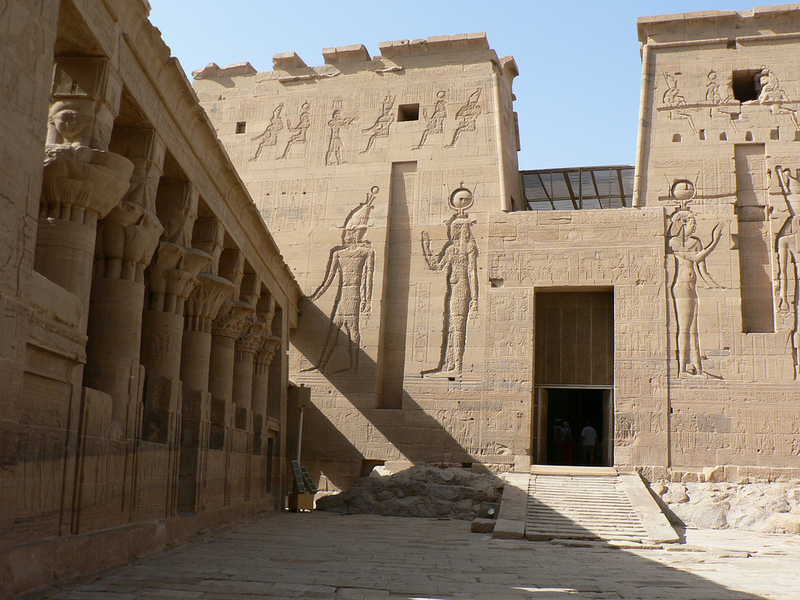 The sanctity of Philae during the Graeco-Roman period out- rivalled many of the other cities of Egypt. It had become the centre of the cult of Isis, which was revived during the Saite period (664-525 BC). The Ptolemies, as already noted, sought to please the Egyptians by building temples to their most beloved gods and goddesses. Ptolemy II (285-246 BC) started construction of the main Temple of Isis. A temple to her consort, Osiris, was built on a neighbouring island, Bigeh (only a portal of which remains). Their son Horus, or Harendotus as he was called by the Ptolemies, had a temple of his own on Philae. 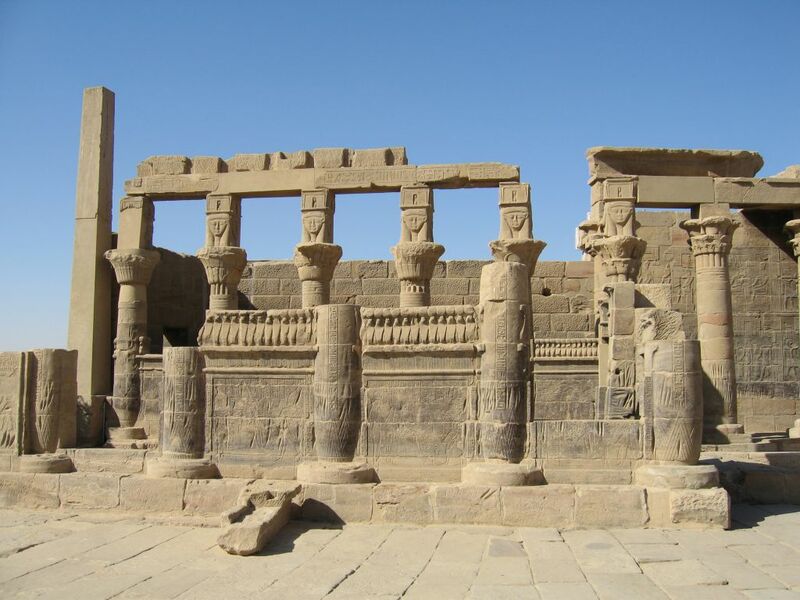 Other structures on the island included a small temple to Imhotep, builder of Zoser’s Step Pyramid at Sakkara, who was later deified as a god of medicine, and temples to two Nubian deities: Mandolis and Arhesnofer. Philae was situated south of Aswan and, therefore, strictly belonged to Nubia. Isis was worshipped by Egyptians and Nubians alike. Fantastic tales were told of her magical powers. It was believed that her knowledge of secret formulae had brought life back to her husband Osiris; that her spells had saved her son Horus from the bite of a poisonous snake; and that she was the protectress of all who sought her. Countless visitors came to the island, where the priests, appropriately clad in white vestments, claimed a knowledge of the mysteries. With carefully rehearsed liturgies and the necessary symbolism, they drew hordes of faithful. If these visitors were lucky they could view the image of the goddess during the spring and autumn festivals in her honour. This was when the death and resurrection of Osiris was enacted, in which Isis played a major role. It was Isis who found the body of her husband that had been locked in a chest and cast on the Nile by his wicked brother Set. It was she who made the body whole through her prayers. It was she who knew the secrets, the spells, and even the name of the Sun-god. Isis was the great goddess; she was at once mother-goddess and magician. It was believed that her single tear, shed for Osiris, caused the annual flood, which brought life to the land. The myth of Osiris and Isis had, by this time been enlarged and embellished countless times. In one version the coffin containing the body of Osiris was swept out to sea, and came to rest on the Phoenician coast where a tamarisk tree enclosed the entire coffin in its trunk. The king of Byblos, who needed a strong prop for the roof of his palace, ordered the tree to be cut down. Were it not for the fact that the tree gave off a sweet-smelling odour, which spread across the Mediterranean, and reached Isis, she would never have been able to trace the body of her husband. She set off for Byblos without delay and, disguised as a nurse, she took charge of the newborn son of the king. When she finally revealed who she was, and the reason for her being there, the king gave her the miraculous tree containing the coffin, and she took the body of Osiris back to Egypt. This was when Set found it, and cut it to pieces. Once established on the island ofPhilae, the priests lost no time in laying claim to additional territory: over eighty kilometres lying to the south of Seheil island. They found an ancient tradition on which to base their claim. In a forged inscription inscribed high on the rocks of Seheil, is a record of how a governor of Elephantine appealed to the pharaoh Zoser (builder of the Step Pyramid some 2,500 years earlier) because of his concern for the people following years of famine. Zoser responded by enquiring about the sources of the Nile and asked whether the governor knew which god controlled its waters. The governor promptly responded that it was Khnum of Elephantine but that he was angry because his temple had been allowed to fall to ruin. Zoser forthwith issued a decree granting a large tract of land to Khnum and levying a tax on all those who lived on the produce of the river, fishermen and fowlers alike, for the benefit of the priests of Khnum. It was this land that the priests of Philae claimed had been granted to them by the pharaoh Zoser, and for the same reason: to put an end to the famine that had been raging for seven long years. The taxes on fishermen forthwith went to their benefit. Each day the priests would wend their solemn way into the holy precincts of the temple of Isis with incense and burnt offerings. The statue of the goddess would be ceremoniously washed, clothed and adorned. Service after service, ritual after ritual, with humility, chanting and prayer, she would be suitably appealed to and adored until such time as she was undressed, washed again, derobed and replaced in the sanctuary until the following morning. A second inscription shows that their wishes were granted, and a third indicates satisfaction at the arrangements made to safeguard them from annoyance. These Greek and hieroglyphic inscriptions on the base of the obelisks played a part in the decipherment of hieroglyphics. The Rosetta Stone alone was not the key, despite its three copies of a single text in hieroglyphics, demotic and Greek that led to the identification of the word ‘Ptolemy’. William Bankes, an English traveller, scholar and collector, to whose estate the obelisk was taken (having been retrieved by Giovanni Belzoni), sent copies of the Greek and Egyptian texts to different scholars, pointing out the hieroglyphic form of ‘Cleopatra’. These two names, and others, eventually made it possible to identify seventeen of the twenty-five letters of the hieroglyphic alphabet. The obelisk now stands in the park of Bankes’s house at Kingston Lacy in Dorset, England. Building operations on Philae continued throughout the Roman period. There seems to have been an effort to indicate both continuity of rule, and also to retain the support of the powerful priests on the island near the southern frontier. It was at this time that Plutarch, the Greek writer, came to Egypt, and combined the many variations of the Osiris myth, from the earliest version (page 13) to the later (page 184), into a coherent tale. By this time Osiris had become the just and wise ruler, not of Egypt alone, but of the whole world. He left Egypt under the wise council of Isis, and, accompanied by Thoth, Anubis and Wep wawat, he set off to conquer Asia. He returned to Egypt only after he had spread civilization, peacefully, with song and music, far afield. It has been suggested that this aspect of the myth so closely resembles the stories of Dionysus and Orpheus that Plutarch may have been influenced by them. The access to the island was enlarged on its northern side by Diocletian, in whose reign the Christians were persecuted. It is ironical that this uniquely picturesque sanctuary was the only peaceful spot in an area that had known nothing but strife from the Persian period (525 BC) onwards. The Meroitic Kingdom had spread northwards and challenged Egypt (page 130). Desert tribes, known as the Blemmys and the Nobadai, who habitually warred with one another, made their appearance around Aswan and terrorised Upper Egypt. There was no security along the frontier. It is not surprising, therefore, that the island of Philae, isolated and protected from attack and showing a spirit of tolerance to the worship of various gods, should develop a conciliatory character. It was chosen as the venue for the signing of peace treaties; Augustus, the first Roman emperor of all Egypt, ordered his prefect to come to terms with representatives of the Meroitic Kingdom, and the meeting took place on Philae; later, negotiations were conducted there between Roman officials and the Blemmys. It is noteworthy, however, that even in times of conflict, the priests of the Blemmys were given right of entry to the island, and they came in peace. Garrisons and treaties notwithstanding, the attacks of the Blemmys were renewed year after year. Finally, Diocletian considered it a waste of manpower to keep soldiers stationed in a nonrevenue raising area. He ordered their withdrawal. But not before inviting the Nobadai, the long-standing enemies of the Blemmys, to settle in the area and act as a buffer. The Nobadai were provided with a subsidy for their services and the fortifications were strengthened. As so often happens, a common enemy breeds understanding. The Nobadai and the Blemmys reasoned that nurturing hostility towards one another was getting them nowhere. If they united their forces and attacked Roman Egypt, they might benefit. This they did. Only when Christianity officially came to Egypt under Theodosius (AD 379-395) (page 202), were the two tribes driven out. The Blemmys, however, obtained permission to visit the temple of Isis for certain festivities and, once a year, to borrow the sacred statue of the goddess to consult the oracle. From a Greek inscription in the seclusion of the Osiris shrine above the sanctuary of the temple of Isis, we learn that in AD 453 the goddess Isis was still worshipped by the Blemmys and their priests. This was long after the edict of Theodosius declared that pagan temples should be closed. 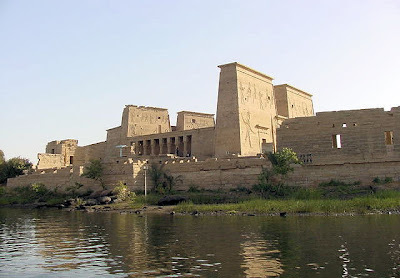 Thus, just as Abydos stands at the beginning of pharaonic history, having given rise to the Thinite kings who first united the Two Lands into a single state, Philae stands at the end, as the last outpost of ancient Egyptian tradition on its native soil. In the reign of Justinian (AD527-565) Narsus finally closed the temple and transported statues of some of the deities to Constantinople.